191 Beachwalk Villa - Relax, Enjoy, Have Fun - Steps to Beach! Relax, enjoy and have fun in this luxurious Beachwalk Villa in Shipyard Plantation. 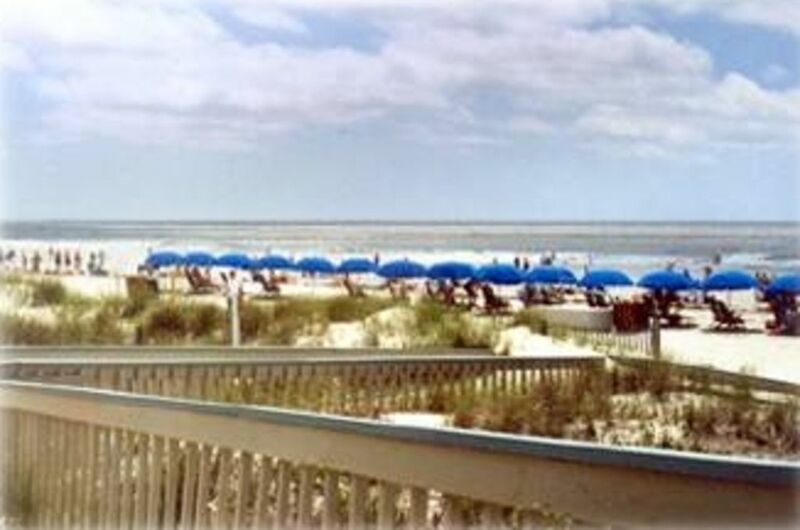 Beachwalk is the closest complex in Shipyard to the beautiful beach of Hilton Head. An 8 minute walk, and you are there. Or you may want to unwind at the Beachwalk swimming pool just steps away. This fully furnished, two bedroom, two-bath condo/villa is bright, spacious, and airy. The master bedroom has a king bed and the 2nd bedroom two single beds. There is a pull-out loveseat and a roll-away bed to comfortably sleep 6. You can also enjoy the outdoors on the sunny wrap-around deck. Shipyard Plantation is a serene, picturesque, and exclusive community far from the maddening crowds. The sandy, white beach is wide and expansive. Family oriented. Tennis is available just across the way at the world-famous Van Der Meer Tennis facility. 27 holes of championship golf onsite with ten other courses nearby. Shipyard offers infinite recreational options, including biking,in-line skating, fishing, and numerous beach activities. Shipyard Plantation is conveniently located near everything. Once inside the gates, it's like a hideaway with beautiful bike paths and challenging golf courses without any of the usual resort traffic. Day tripping is plentiful; don't miss an excursion to the charming, 'low country' cities of Savannah (40 minutes), Charleston (2 hours), or Beaufort (30 minutes). The island offers an abundance of shopping options, including wonderful shops, factory outlets and malls. I enjoy the active life style of Hilton Head! 191 Beachwalk provides enjoyment, relaxation, and privacy. Local Phone (with answering machine), Ceiling fans, 2 TV's with cable, Living Room HD/TV with HBO, WI/FI Internet access, Full Kitchen - Stove, Dishes, Cookware & Utensils, Iron, Ironing Board, Beach Locker - 4 beach chairs and various beach toys, Bed Linens, Bathroom towels provided. Non Smoking Unit. This is a lovely place to stay! Daniella was more than a host. We had hurricane Florence knocking on our door while we were down there and Daniella made sure we were informed and safe the whole time! We will definitely be coming back. Thank you for the kind words. Look forward to your return visit. Cheers! This location was clean and well decorated. Easy access location to beach and pool and restaurants in the area. Only suggestion would be beach towels, but overall was great and would definitely book again. Many thanks for the review. Glad you all enjoyed it. The condo was great for our family. It had everything we needed. The location was perfect. We biked to the beach every day & the beach accessories available for use was so convenient. We couldn’t ask for anything better and would definitely stay here again! Thank you so much for your review. I am glad that you all found the condo comfortable and enjoyed all the Island has to offer. Many thanks for your review. Glad you enjoyed your stay. Thanks for the review. I'm so happy you had a great holiday. Looking forward to your return visit. Have a great rest of the summer. Spacious, bright and clean. Enjoyed our stay. Great condo! The only negative is it’s not on the beach. It was a pleasure having you as guests of my condo. EXTENDED STAYS: Bookings outside of the standard 'week' or 'month' number of days - rates are negotiable based on the rate posted on the listing. NOTE: A cleaning fee of $150 is added to 4-day minimum stay. PAYMENTS: $200 deposit is required to secure the booking if timelines permit. PAYMENTS TO OWNER MADE ONLY BY PERSONAL CHECKS ONLY. The VRBO Booking Fee is paid directly to VRBO according to their payment options.